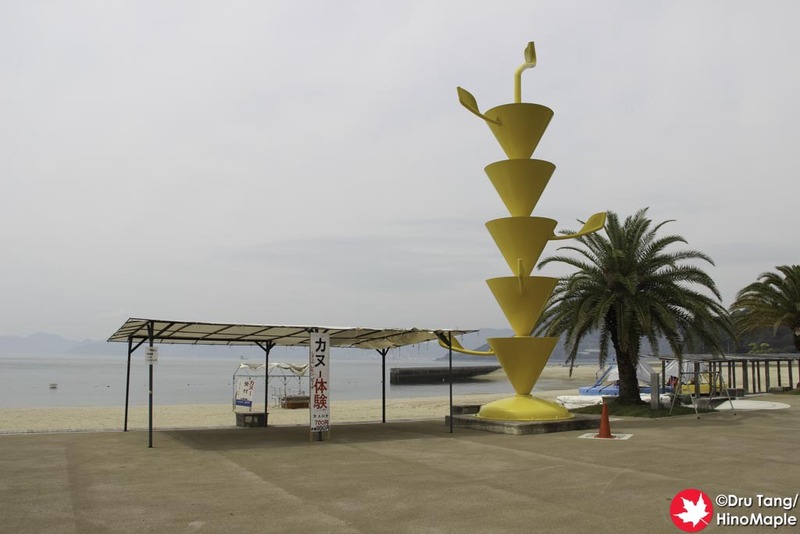 While cycling around Ikuchijima, I couldn’t help but notice the various artworks all over the island. I even noticed a couple of artworks (at least I think they were art) out in the sea off the coast of Ikuchijima. Technically there are 17 artworks scattered all over the island with the majority being on the north coast. If you are keeping an eye out for interesting things, you are likely to see most of them, like I did. The art starts on the northeast corner of the island. 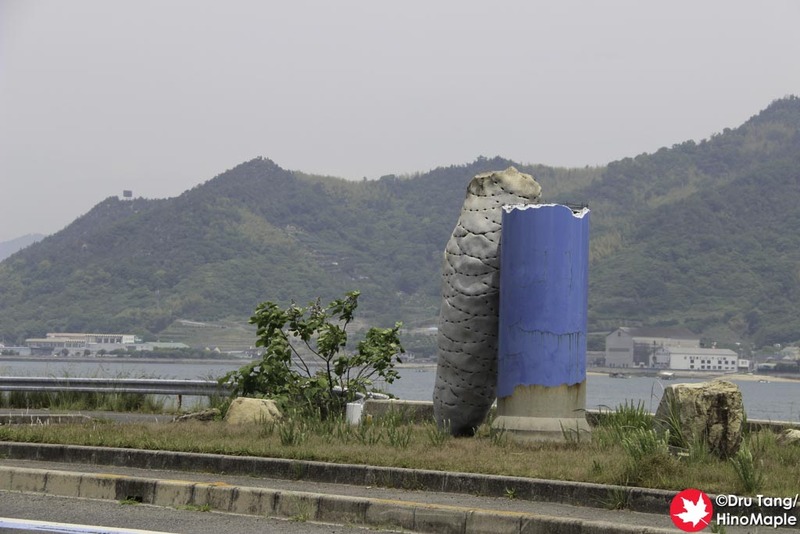 Just after you cross the Ikuchijima Bridge and head along the north coast, you will see the first artwork, “The Crust”. 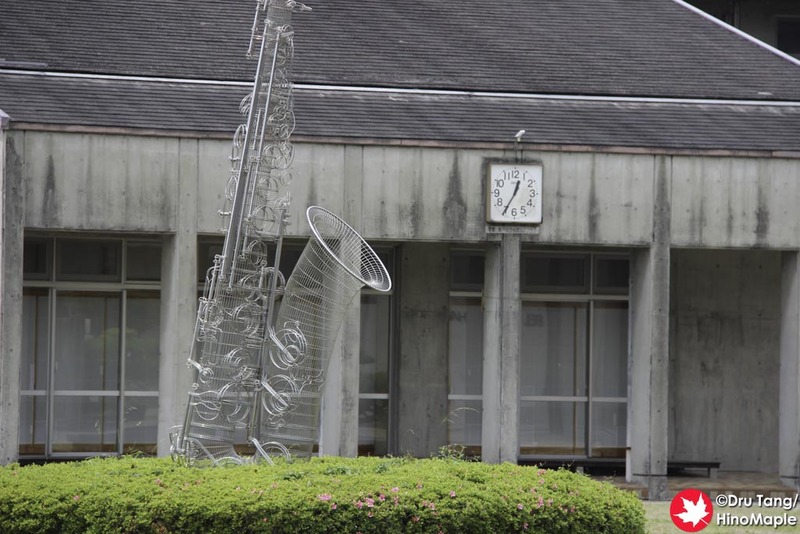 “The Crust” by Atsuo Okamoto is a simple piece that somehow looks like a column with a cocoon on the side. Not really what I would call a great piece of art, but interesting to see. I didn’t even stop to take the photo, but I did get this moving shot of it. I next came across 3 different artworks in the same area. I think there might have been one more but I missed it. I actually didn’t take many photos of these as I didn’t know if it was part of the island art or not. I didn’t research the island art enough but some of these art pieces weren’t particularly interesting to me either. 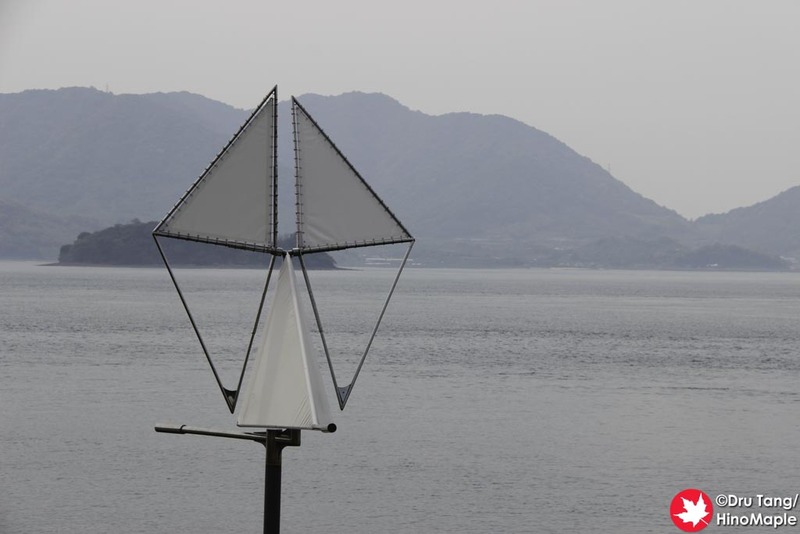 The first is “It is Breezing (in Setoda)” by Kozo Nishino. This is basically a mesh sax on the grass. 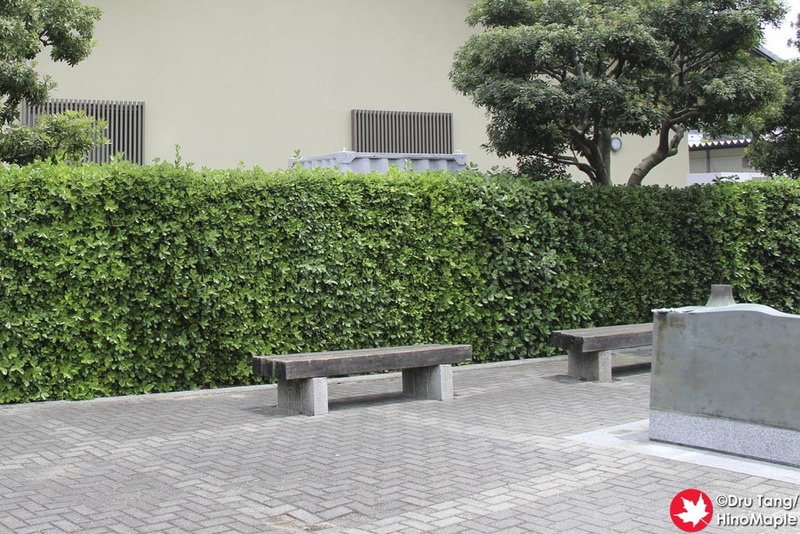 It’s a pretty standard piece that fit with being in the courtyard of a large concert hall. There was also “Only for One Bird” by Shintaro Tanaka, a somewhat abstract looking piece, and then “Gift from the Sea” by Masamichi Yamamoto which was just boring for me. I’m sure other people will have a different opinion but this is just how I felt. 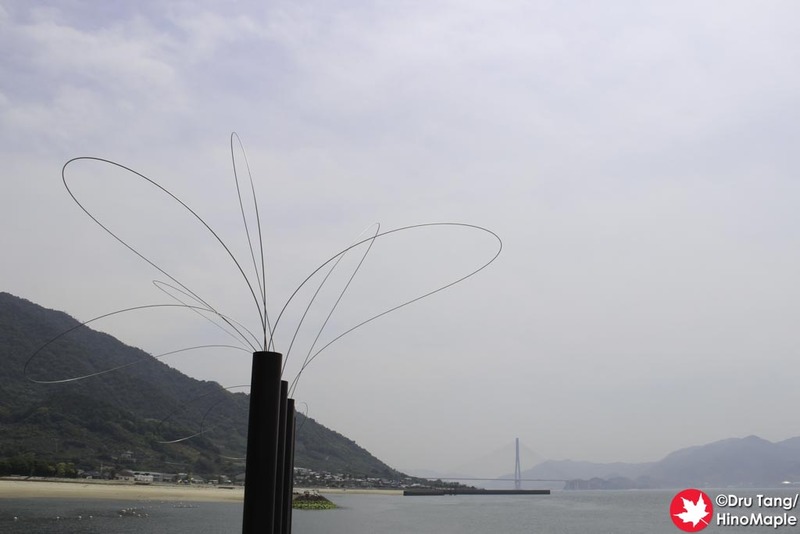 On my way from Setoda Port to Sunset Beach, I came across this interesting piece, “Wings of the Waves” by Susumu Shingu. “Wings of the Waves” is like watching a wind chime as it just floats and moves freely in the breeze. It is quite elegant in how it moves, just like a wind chime. 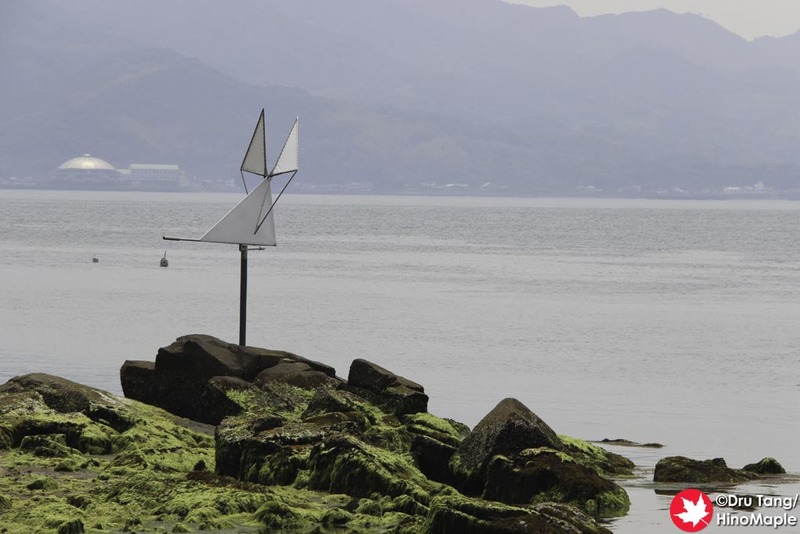 Just before you get to Sunset Beach, you will see “Utsurohi” by Aiko Miyawaki. This is a very difficult piece to photograph as it is a set of pillars with wires on top. The wires are hard to capture in a photo and you really need to go there in person to really get a good feel of the art. At Sunset Beach, there is a group of art pieces that, while they don’t look terrible, don’t really stand out. They sometimes look out of place and whoever decided to allow them really allowed a style of art that just doesn’t speak to me. 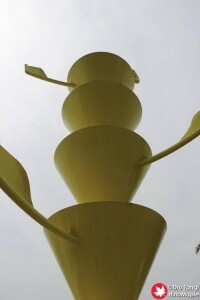 The first is “Come In to the Sky” by Masafumi Maita, a tall set of yellow cones that is right in the middle of the rest area. It was tall and realtively interesting, but nothing for me to rave about. 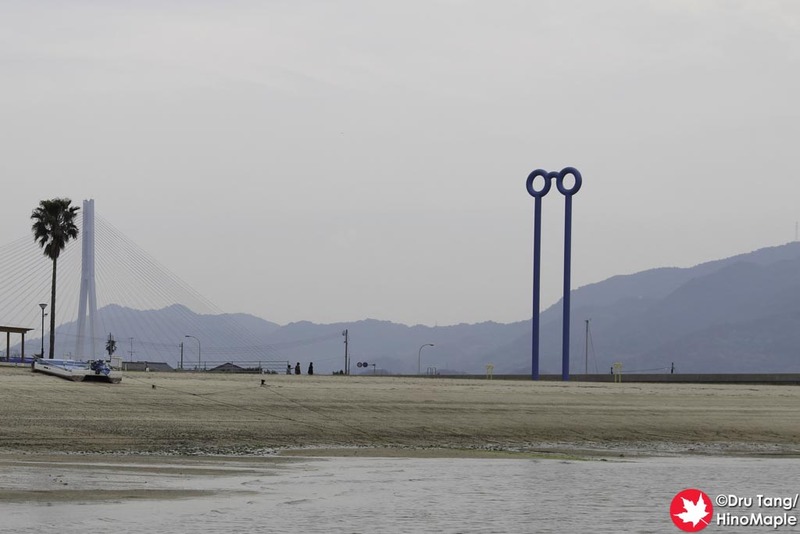 There was also “Clairvoyance” by Shin Matsunaga, what appeared to be a pair of glasses on 2 poles. It didn’t speak to me enough to make me want to go and see it up close. Trying to see all of the different art pieces on Ikuchijima is a fun thing to do but I really didn’t care for it compared to the better art islands near Takamatsu. 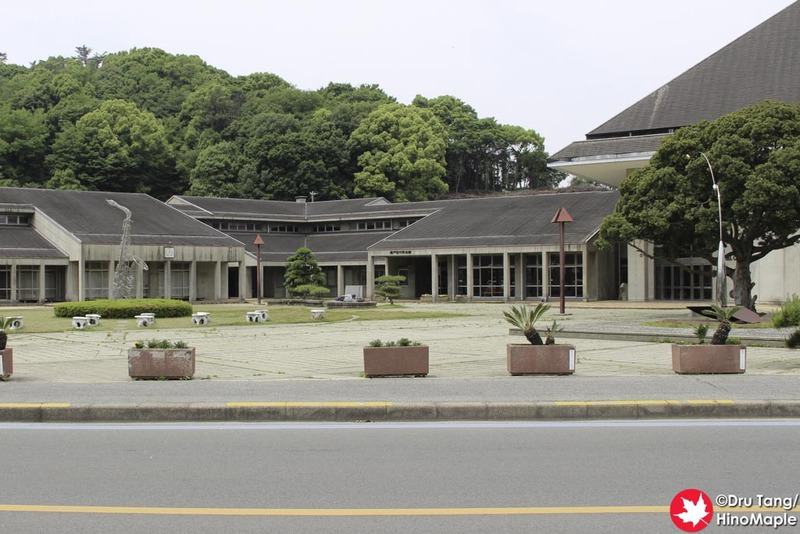 Naoshima, Ogijima, and all of the other islands between Kagawa and Okayama have better curators who seem to link the art with the island better. Ikuchijima was not bad but not in a style that I liked. I hope that things continue to expand on the island but I feel the island has much more to offer than trying to be a western Naoshima. 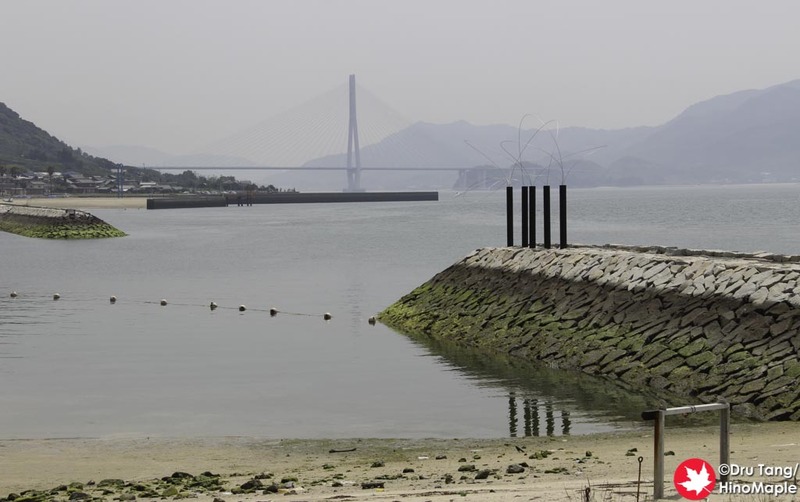 This entry was posted in Chugoku and tagged Aiko Miyawaki, art, Atsuo Okamoto, Ikuchijima, Ikuchijima Island Art, japan, Kozo Nishino, Masafumi Maita, Masamichi Yamamoto, Seto Inland Sea, Setouchi, Shimanami, Shimanami Kaido, Shimanamikaido, Shin Matsunaga, Shintaro Tanaka, Susumu Shingu by Dru. Bookmark the permalink.